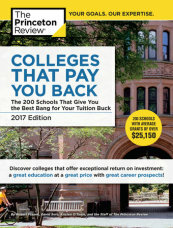 The Princeton Review ® (www.princetonreview.com) released the 2017 edition of its annual guide to colleges that the education services company considers the nation’s best for academics, affordability/financial aid, and for getting their graduates out the door to satisfying and rewarding careers. Colleges That Pay You Back has detailed school profiles, plus seven ranking lists: one titled “Top 50 Colleges That Pay You Back” (based on Princeton Review’s ROI ratings), and six “Top 25” lists. The Colleges That Pay You Back project is an expansion of The Princeton Review’s annual Best Value Colleges book and list first published online in 2004. The Princeton Review expanded the rankings and published its first edition of the book with Random House in 2011. It was then further expanded in response to findings of its 2015 College Hopes & Worries Survey (www.princetonreview.com/college-hopes-worries) that polled 12,000 college applicants and parents. Franek noted, “While 100% of our respondents viewed college as ‘worth it,’ worries about college costs and job prospects ran deep. Colleges That Pay You Back also has a list of “Great Schools for the Highest Paying Majors” and profiles of nine tuition-free schools. It is one of 150 Princeton Review books published by Penguin Random House in a line that includes The Best 381 Colleges, known for its 62 categories of college rankings, and Paying For College Without Going Broke. The Princeton Review selected these schools based on a comprehensive analysis of more than 650 colleges that weighted 40+ data points to tally ROI (return on investment) ratings for the schools. Data analyzed covered academics, cost, financial aid, graduation rates, student debt and more. The company collected that data from its 2015-16 surveys of administrators and students at the schools. It also factored in data from PayScale.com collected from their online compensation survey on starting and mid-career salaries of alumni of the schools. The full lists, profiles, and information on the project methodology are accessible at www.princetonreview.com/colleges-pay-you-back. This entry was posted in College Prep, Parenting Teens, Senior Year & Prom and tagged college prep, College saving. Bookmark the permalink.